The Mad Prof's latest offering should satisfy your need for Tweed. 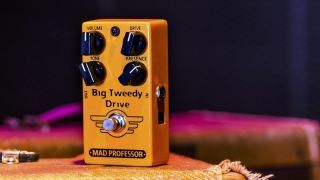 NAMM 2017: If you're seeking the answer to American tweed tone in pedal form, you should look to Finland, apparently, as Mad Professor launches its Big Tweedy Drive. Based on Fender's high-power tweed Twins, made in the late-'50s and used by the likes of Keith Richards, Eric Clapton, Joe Bonamassa and Rory Gallagher, the Big Tweedy Drive promises the snarl, saturation and touch-responsiveness of those original amps. Four controls - volume, drive, tone and presence - tweak the pedal, which offers "world-class tone that fits beautifully into a surprisingly broad range of genres", according to MP. The Big Tweedy Drive is available in March 2017, with RRPs likely to be confirmed with the pedal's launch at NAMM. More details are up at Mad Professor.